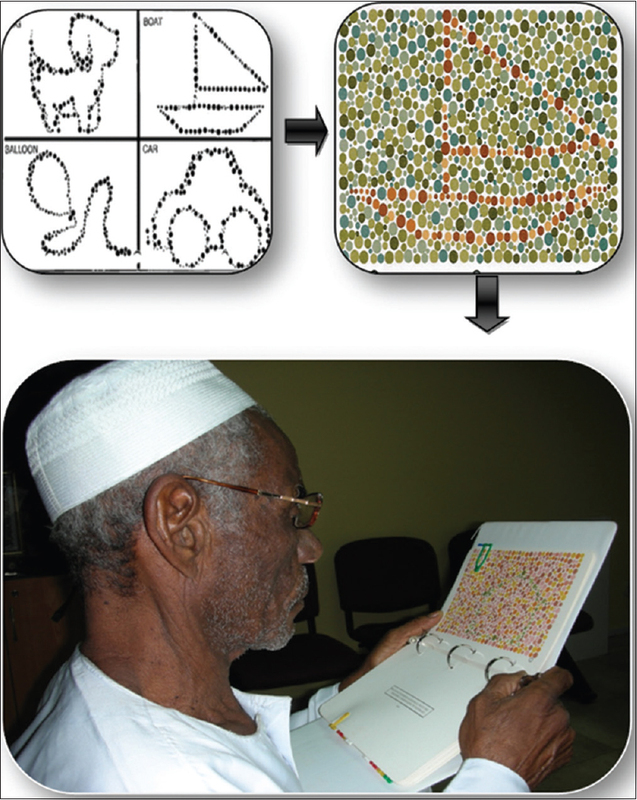 Aim: The aim is to assess color vision in Sudanese elderly patients' pre- and post-cataract surgery. Materials and Methods: Descriptive, cross-sectional, hospital-based study was conducted in in Makkah Eye Complex (a voluntary organization; a Tertiary Eye Care Center) in Khartoum Alryad. Elderly patients (200); their age varies from 60 to 95 (mean 67.91 and standard deviation ± 6.779) years with senile cataract were asked to participate in the study. Participation was entirely voluntary. Information was collected by means of interviews, questionnaire, and clinical examination. The data were analyzed using Predictive Analytic Software Statistics Version 18 (2010), a modified version of IBM SPSS Inc. PASW Statistics for Windows, Version 18.0; 2009. Chicago: SPSS Inc. All tests are of two sides (confidence interval of 99% level). Therefore, a P≤ 0.05 was taken to indicate the statistical significance for all analysis and spearman correlation (r) was used to identify association between variables. Results: In the presence of cataract, the results showed significant declines in visual acuity (>85% visually impaired). Failure to discriminate colors were recorded in right eye (RE) (56%) and left eye (LE) (60%). Improved visual functions as a result of cataract surgery included the following: Better optically corrected vision (71%) achieved satisfactory visual outcomes (logarithm of the minimum angle of resolution [LogMAR] >0.48) with average distance visual acuity (VA) of (0.36–0.46 Log MAR) and in increased ability to discriminate colors (90%) and 89% for RE and LE, respectively. Both pre- and post-operative results showed positive correlation for RE and LE and (P < 0.001) for Pearson Chi-square value were recorded for showing statistical significance for VA and color vision in the patients studied. Conclusions: VA and other retinal functions like color vision are restored by cataract extraction. The changes in the retina and the neural connection that can accompany the normal aging process are largely inferential rather than directly observable in the normal eye.,,,, Examinations of retinal functions  are mandatory since the prognosis for visual recovery after surgery depends, especially on retinal health.,,,, Consequently, retinal function ,, can be investigated by application of simple tests such as color vision testing made easy (CVTME) (assessment of color vision), contrast sensitivity charts (Pelli–Robson), amsler grid (assessment of central visual field), and logarithm of the minimum angle of resolution visual acuity (VA) chart. The usual tests of sensory neural integrity show small but definite decrements in the absence of disease or degeneration. The yellow pigment of the lens absorbs the short wavelengths more than the long. Thus, older people have a decreased sensitivity at the violet end of the spectrum. White objects may appear yellow, and the distinction between blues and greens is decreased. Moreover, the color differences between dark gray and dark brown will be less.,, Since there is great variation between older individuals of the same age, it is not possible to state that any given 70-year-old will have significant difficulty with color vision of those over 55 years of age or so should be checked at regular intervals. The study was descriptive, cross-sectional, hospital-based study. Elderly patients (200) with senile cataract attending ophthalmic ultrasonography clinic: A-B scan department attending primarily for IOL measurement and posterior segment evaluation were asked to participate in the study. Participation was entirely voluntary. Information was collected by means of interviews, questionnaire, and clinical examination. The research was conducted using standard instruments available at the hospital clinics and protocol [Figure 1] and Appendix A]. The data were analyzed using Predictive Analytic Software Statistics Version 18 (2010) a modified version of IBM SPSS Inc. PASW Statistics for Windows, Version 18.0; 2009. Chicago: SPSS Inc. All tests are of two sides (confidence interval of 99% level). Therefore, a P≤ 0.05 was taken to indicate the statistical significance for all analysis and spearman correlation (r) was used to identify association between variables. Patients attending from other states were included Consent was obtained for all patients studied [Appendix B]. Color vision assessment was performed using “CVTME” [Figure 2]. The main advantages of this test were as follows: Suitable for all age groups, for all languages using simple pictures and symbols. This test was used for screening purposes to detect gross changes in the ability to discriminate colors in the population studied. The results were recorded monocularly as pass or fail (to pass all the cards must be recognized; if any of the plate missed it indicates the patient failed) comparisons were made between the eyes of the same patient (right eye [RE]: Passed and left eye [LE]: Failed). Patients were included in the study with the age group of between 60 and 95 years, mean 67.91 ± 6.779 years. The percentage distribution of elderly males and females were 54% and 46%, i.e., 1.17:1, respectively. The majority of patients attending hospital were from States 62%, whereas only 38% were Khartoum residence with a ratio of 1.63:1, respectively. [Table 1] illustrated that about one third (34%) of the patients had the same type of cataract in both eyes, whereas two thirds showed different characteristic. Common stages of cataract present among patients were immature cataract 44% and 42% for RE and LE, respectively; mature RE (41%) and LE (38%). According to the WHO classification, the results for preoperative group indicated 85% of the patients were actually visually impaired and only 15% were not visually impaired [Table 2]. Sixty-four percent of the patients had the same type of cataract extraction in both, whereas 36% had different types. 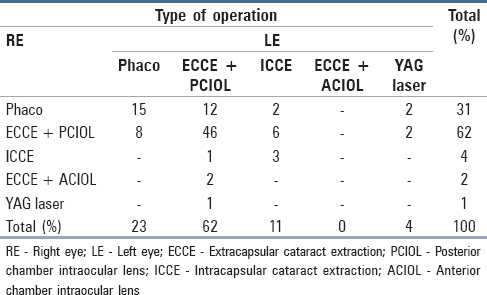 Extracapsular cataract extraction + posterior chamber intraocular lens (ECCE + PCIOL) was the most common type of cataract surgery performed (62%) for both eyes [Table 3]. [Table 4] showed weak positive correlations for RE and LE; and Pearson Chi-square (P > 0.005) for both eyes suggesting no statistical significance for VA and type of operation. [Table 5] showed the results obtained for postoperative group which had indicated 71% of the patients had gained satisfactory vision >0.48 after bilateral cataract extraction, 7% patients were in the border line, and the remaining showed different degrees of visual impairments. [Table 6] showed cross-tabulation for color vision. Similar characteristic of color vision in both eyes in 48% of patients, nevertheless 52% of the cases reported different characteristic (one eye passed and the other failed). [Table 7] showed positive correlation for RE and LE. Pearson Chi-square (P < 0.001) was recorded for BE showing statistical significance for VA and color vision. [Table 8] showed the crosstabulation for color vision: About 85% of patients had similar characteristic, nevertheless 15% of the patients reported different characteristic (one eye passed and the other failed). [Table 9] indicated positive correlations and (P < 0.001) for Pearson Chi-square value were recorded BE showing statistical significance for VA and color vision in the patients studied. Considering Tables 4 and 5, it was evident that 71% of the patients had gained satisfactory vision >0.48 after bilateral cataract extraction; however, the results indicated (P > 0.005) for both eyes suggesting no statistical significance for VA and type of operation. In this study, CVTME was used for gross color discrimination to indicate whether the patient was able to detect colors or not. The results obtained [Table 6] and [Table 7] for preoperative group illustrated 48% of patients showed equal characteristic of color vision in both eyes (16% passed and 32% failed), and 52% of the patients showed different characteristic between the two eyes (one eye passed and the other failed); it showed high positive correlation for RE (r = 0.768) and LE (r = 0.778); and Spearman Chi-square (P < 0.001) were recorded for RE and LE indicating high statistical significance for VA and color vision in the patients studied. Findings indicated color vision defects, which could be explained in term of reduced VA, reduced contrast sensitivity as well as presence of cataract. Color vision assessment was performed postoperatively [Table 8] and [Table 9]; 85% of patients had similar characteristics, nevertheless 15% of the patients reported different characteristic. Positive correlation for RE (r = 0.501) and LE (r = 0.465); and (P < 0.001) for Pearson Chi-square value were recorded for BE showing statistical significance for VA and color vision in the patients studied. Studies ,,,, suggested the ability to discriminate colors decline with age, similar findings were obtained from this study; but nevertheless, the majority of those who had failed; they were able in actual reality to detect at least one color. Since subtle changes in color vision may be the first sign of disease, it is important that the color vision of aging patients be determined at regular intervals and that comparisons be made between the eyes of the same individual as well as with some normal standard. In general, cataract treatment had resulted in improvement in VA, color vision, and improvement in patient's quality of life. Longitudinal studies using diagnostic tests are recommended. Consents were obtained from all patients prior conducting interviews and performing clinical examination. Authors express their gratitude to the manager of Makkah Eye Complex, Dr. Lakho, K. for giving us the opportunity to use the hospital clinics; and the elderly patients for scarifying their time to participate in our study. Amos JF. Patient history. In: Eskridge JB, Amos JF, Bartlett JD, editors. Clinical Procedures in Optometry. Ch. 1. Philadelphia: J.B. Lippincott Company; 1991. p. 3-5. Bailey IL. The optometric examination of the elderly patient. In: Rosenbloom AA, Morgan MW, editors. Vision and Aging. 2nd ed., Ch. 7. USA: Butterworth-Heineman; 1993. p. 200-19. Michaels DD. Ocular disease in the elderly. In: Rosenbloom AA, Morgan MW, editors. Vision and Aging. 2nd ed., Ch. 4. Butterworth-Heineman; 1993. p. 116-47. Morgan MW. Normal age-related vision changes. In: Rosenbloom AA, Morgan MW, editors. Vision and Aging. 2nd ed., Ch. 6. Butterworth-Heinemann; 1993. p. 178-95. Rosenbloom AA. Care of the visually impaired elderly patient. In: Rosenbloom AA, Morgan MW, editors. Vision and Aging, 2nd ed., Ch. 12. Butterworth-Heinemann; 1993. p. 348-9. American Academy of Ophthalmology AAO. 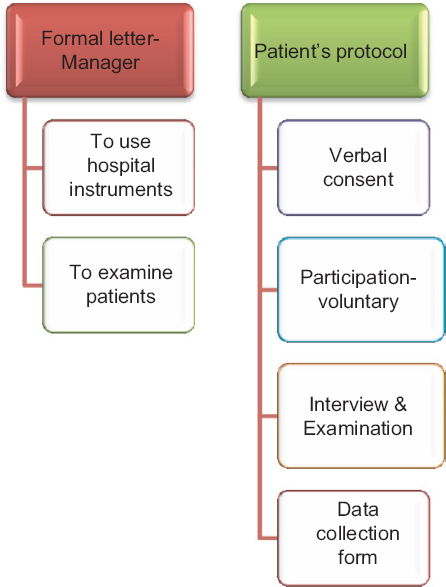 Factors Affecting Surgical Outcomes; 2011. Available from: http://www.surgeryencyclopedia.com/Ce-Fi/Extracapsular-Cataract-Extraction.html#ixzz1aHzGzajg. [Last reassessed on 2015 Feb 15]. Elawad M, Elawad H, 2011(a). EyeZone: Vision related quality of life in Sudanese patients with senile cataract (preoperative cases). EyeZone Issue 35: January/Feburary 2011. Studies and Research: p. 34-9. Elawad H, Elawad M. Biometric measurements: Average intra-ocular lens power for Sudanese patients with senile cataract. Sci PG J Phys Chem Optics 2015;4:25-30. Elawad H, Elawad M. Senile cataract in Sudan: Vision and vision-related quality of life. J Int Res Med Pharm Sci 2016;8:123-8. Available from: http://www.ikpress.org. [Last reassessed on 2015 Feb 15]. [International Knowledge Press]. Elawad H, Elawad M. Biometric measurements: Average intra-ocular lens power for Sudanese patients with senile cataract. Sci PG J Phys Chem Optics 2015;4:25-23. Elawad H, Elawad M. Cataract surgeon's opinions: Surgical complications and factors affecting surgical outcomes in Sudan. J Dis Glob Health 2016;5:193-210. Available from: http://www.ikpress.org. [Last reassessed on 2015 Feb 15]. [International Knowledge Press]. Batterbury M, Bowling B. An Illustrated Colour Text Ophthalmology: Diseases-lens. Churchill Livingstone; 1999. p. 48-4, 56. Davis LN. Ocular biometry, colour vision testing and electrophysiology. In: Lay M, Wickware E, Rosenfield M, editors. Optometry: Science, Techniques and Clinical Management. Ch. 19. Butterworth-Heineman, Elsevier; 2009. p. 303-17. Kanski JJ, Bowling B. Lens. Clinical Ophthalmology: A Systematic Approach. 7th ed., Ch. 9. Elsevier; 2011. p. 270-311.